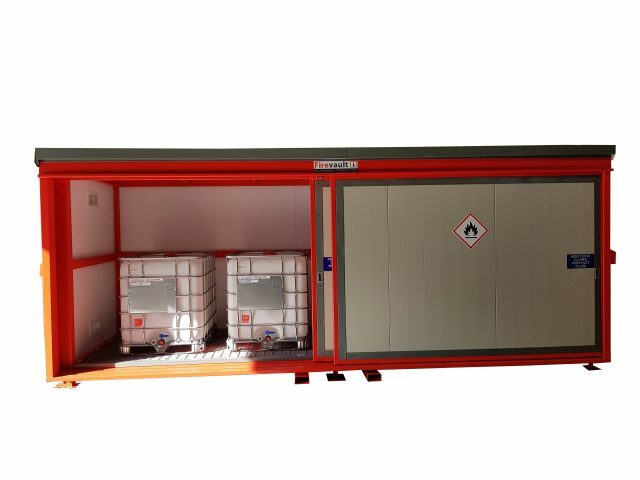 Mr. Niall McCormack of Megazyme contacted Chemstore in relation to our Firevault range and outlined a project for two 4 Pallet Firevaults. The project required a 1Hr Fire Rated construction and required sliding doors due to the tight space on site. There was a tight offloading area which was taken into account during our full site inspection. The 2 stores also needed to have the same floor space as 2 previous stores. “We purchased two Firevaults from Chemstore. From the beginning, the Chemstore team were easy to deal with and very professional. Every detail was explained from the design phase to the installation phase. Both Firevaults are built to a high standard and are suitable for our requirements. I highly recommend Chemstore and look forward to dealing with them into the future”. 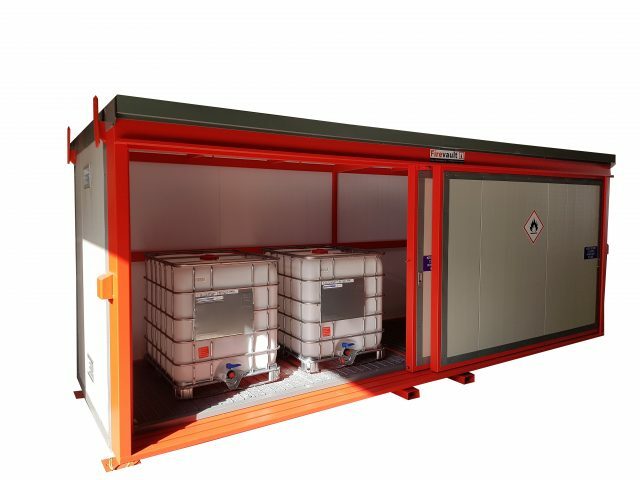 Storage: 4 pallets, 16 x 200L drums or 4 X 1,000L IBC’s, stored on 1 level. Construction: Robust all welded 100 x 50mm steel box section frame. Sumps: Non-combustible, corrosion resistant coated steel sumps fitted under floor level. Shelving: Shelving constructed from fully galvanised grid decking. Access: Twin heavy-duty sliding doors, fully padlockable. Lifting: Unit is fitted with forklift channels and roof-fixed crane lift points to allow for easy unloading and relocation. Ventilation: 4 no. intumescent ventilation Pyrogrilles fitted as standard at high and low level to ensure good ventilation throughout the store. When tested to BS 476 part 22 the panels exhibit a 1 hour fire-rating. Resistance to the passage of flames 110 mins. Insulation on temperature 80 mins. There is, therefore fire resistance to the wall construction of 80 mins. External colour: Choice, standard Goosewing Grey. Internal colour: Choice, standard White. The profiled, single skin roof cladding is therefore designed to be of a notably lighter construction than that of the wall and door panels. Finish: Framework: All steel coated with high build Acrylic paint finish system to ISO 3233:1998. Choice of colours. Standard: Red RAL 3020. Internal: White chemical resistant Stelvetite (PVC) finish on internal walls. Signage: Clear and bold “Firevault”, “Flammable, No Smoking, No Naked Light” and “Keep Door Closed When Not In Use” signs fitted as standard, to BS499. Specific signage available on request.